Te ha quedado deliciosamente real....uhmmmmmmm!!!!! Increiblemente realista y muy delicioso! A truly evocative piece Lin, reminding me of Sunday mornings at my Garndma's. 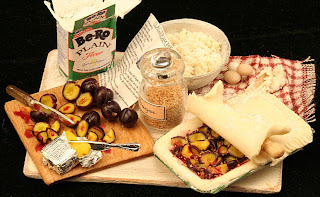 All elements of plum pie are perfect!!! It is perfect, love how you made the setting and it is so real! Oh my God, it is absolute wonderful!! Perfect work as always, Linda. So beautiful! I love it:-)! beautiful works .perfects in each detail!!!!! !great!